Contact Author - Kenneth Rogers Jr. Abuse is nothing to laugh at or to be entertained by, especially sexually or to a child. Author Kenneth Rogers Jr. has taken a different self-help approach in helping men to become healed and overcoming the barriers associated with childhood sexual abuse. 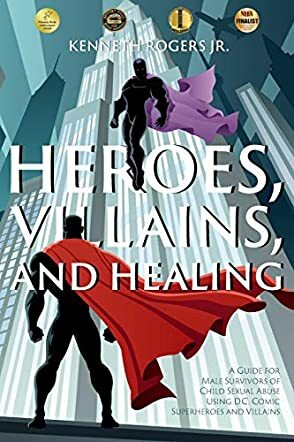 In his book, Heroes, Villains, and Healing: A Guide to Help Male Survivors of Child Sexual Abuse Using DC Comic Superheroes and Villains, men will learn about how their reactions, due to their abuse, have turned them into either a hero or a villain. Superheroes and villains like Batman, Green Lantern, The Joker and Captain Marvel all have talents that they are known for and Rogers displays how they are associated with those that have been abused. Men will learn that the abusive acts weren't their fault, how to display acts of forgiveness, and the best ways to move forward. Did you know that by the age of 18 that one in six males would have been sexually abused? Men are not as openly reporting this tragic violation of abuse as most women, but the scar is still present. And not only are men not reporting it, they're living with it in silence, in some cases never revealing the act even if it had occurred for years. Author Kenneth Rogers Jr. is himself a survivor of sexual abuse that he experienced at the hands of his older sister for two years when he was eight years old. I enjoyed how he cleverly intertwined Batman, Two-Face, Aquaman, and Lex Luthor in explaining the context of how sexual abuse relates to the interaction, reaction and process of how not only these heroes and villains perform, but think as well. I learned a lot that I never knew about the various stages of conditions that affect the victim, from health problems and addictions to depression and suicide, and the thirteen levels of the healing process. This book gets deep and can be hard, not only as you read about abuse and its effects on both the victim and the families once the violation has been uncovered, but also the exercises that Rogers requires of the reader to help them to begin the steps and process to their own recovery. Get ready to work, become transparent, release and transform.